Long-term opportunity could make Clorox, The Walt Disney Company, and Intuitive Surgical top stocks to own over the next five decades. Clorox (NYSE:CLX), The Walt Disney Company (NYSE:DIS), and Intuitive Surgical (NASDAQ:ISRG) could be the perfect stocks to own in uber long-term portfolios. According to Motley Fool contributors, these companies have the catalysts on deck to reward investors for decades, not just in the coming years. Rich Duprey (Clorox): Clorox has helped investors clean up for over a century, and it will undoubtedly be doing the same in the decades ahead, too, as its broad portfolio of brands continues to expand. Best known, of course, for its bleach, Clorox offers an amazing array of household consumer products that include Formula 409, Pine-Sol, and Tilex; Burt's Bees personal care products; Fresh Step kitty litter; Glad brand trash bags and cling wrap; salad dressings from Hidden Valley; and Brita water filters. These are all top-selling products, and Clorox derives more than 80% of its revenues from brands that rank No. 1 or No. 2 in market share in their respective categories. That muscular portfolio produces substantial amounts of free cash flow, which it actively uses it to pay dividends as well as initiate share repurchases. The consumer products giant has paid uninterrupted dividends every year since it was spun off from Procter & Gamble in 1968, and it has increased the payout to shareholders every year for 40 years, even through the financial crisis of the last decade, when its stock was taking a big hit. Clorox operates in more than 100 countries, and that may be its biggest headwind since a strong U.S. dollar has taken a swipe at its returns since it has to retranslate foreign currencies. In its fiscal 2017 second-quarter report last month, it noted total sales grew 5% for the period on strong 8% volume growth, but sales were actually up 6% on a currency-neutral basis. There will be periods of softness for Clorox, as was seen during the recession, and it will experience pockets of weakness in certain categories, such as that currently being exhibited in the bleach market that led to lower Clorox-branded bleach this past quarter. But overall, and because its products span so many parts of our daily lives, Clorox should be a steady performer for your portfolio. If there was a stock to own for the next 100 years, let alone the next 50, Clorox would be one you'd choose. Keith Speights (Disney): Fifty years ago, there was no ESPN. There was no Walt Disney World. But The Walt Disney Company was alive and well after 44 years of being in business. I have no doubt that 50 years from now, Disney will still be delighting children -- and investors. Oh sure, challenges will come and go. Currently, the big headwind for Disney is that many people are canceling their cable subscriptions. That's hurting performance for the company's cable channels, especially ESPN. Disney consists of more than just TV channels, though. The company generates more combined revenue and profits from its parks and resorts, movie studios, and consumer products plus interactive media than it does from its media networks. I don't question that Disney might have to change some things to overcome the problems it faces in cable TV. However, the company has consistently proven itself over the years to be quite adept at making the necessary changes to keep being successful. Disney's secret sauce is its creativity. From the first time Mickey Mouse appeared on the big screen to the latest Star Wars movie, creativity has been the company's hallmark. As long as Disney continues to produce appealing movies and TV programs and keeps creating magical experiences for its theme park and resort customers, the company should keep on thriving. And so should its shareholders. Todd Campbell (Intuitive Surgical): One way to build a long-term portfolio is to focus on disruptive companies reshaping huge and growing industries, and Intuitive Surgical is, perhaps, the best example of that kind of company. Intuitive Surgical pioneered robotic-assisted surgery, and it's established itself as the Goliath in what I believe will be a progressively larger market over the coming decades. A larger, longer-living population is likely to require more, not less, surgical intervention, and increasingly, surgeons will rely on the precision provided by robotics to improve patient outcomes. Currently, there are about 4,000 of the company's da Vinci surgical systems already helping surgeons perform procedures, and as technology improves, these systems will become even more common. If I'm right, then the long-haul opportunity associated with Intuitive Surgical could be massive. The machines cost more than $1 million, and disposable instruments and accessories can run up to $3,500 per procedure. Last year, 750,000 procedures were done with a da Vinci system, and that translated into $1.4 billion in high-margin instrument and accessory sales. Including system sales and service revenue, full-year revenue and profit clocked in at $2.7 billion and $736 million, respectively. 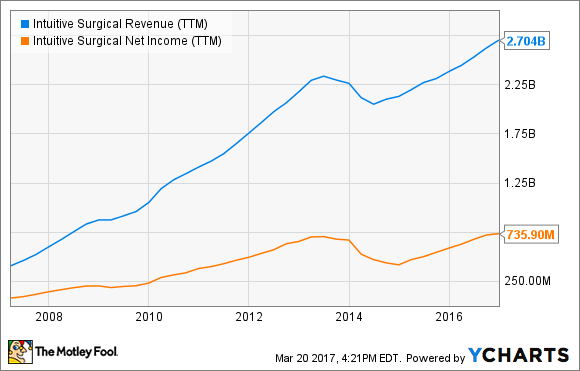 ISRG Revenue (TTM) data by YCharts. Overall, the company's revenue and profit has climbed steadily over the past five years, and frankly, I don't see much that could stand in the way of those trends continuing well into the future.